This activity is supported by educational grants from Novartis Pharmaceuticals and Kite Pharma. 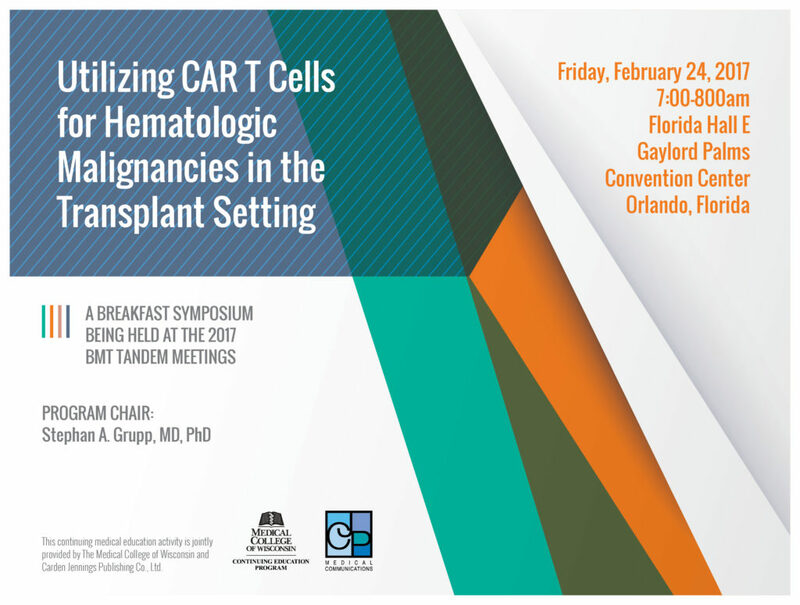 The goal of this educational program is to improve the treatment of patients with hematologic malignancies through the dissemination of information about treating these diseases with CAR T cell therapy. This immunotherapy option appears to be on the brink of approval for certain blood related cancers, which may change the prognosis of patients with these disorders drastically. CAR T cell therapy has shown to bring patients with difficult to treat cancers to remission more quickly and effectively than most previous treatment options. CAR T cells may drastically change the treatment of hematologic malignancies, and this program serves as a medium to give health care professional a chance to recognize these changes. The Medical College of Wisconsin designates this live activity for a maximum of 1.0 AMA PRA Category 1 Credit(s)™. Physicians should claim only the credit commensurate with the extent of their participation in the activity. This enduring material is approved for 1 year from the date of original release, May 15, 2017 to May 15, 2018. Stephan A. Grupp, MD, PhD discloses that he has been a consultant, speaker, and has received research funding from Novartis. Helen E. Heslop, MD, DSc (Hon) discloses that she has ownership interest in Viracyte and Marker Therapeutics. She has intellectual property rights and has been on the Advisory Board for Cell Medica. She also has received research funding from Celgene.